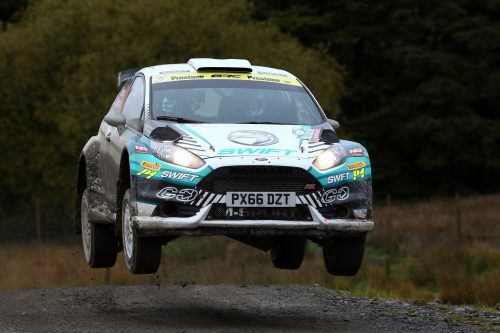 Reigning British Rally Champion Matt Edwards will return to the stages in 2019 to defend his coveted title. Edwards will lead the M-Sport charge in a Ford Fiesta R5 and will be joined in the Swift Group machine by new co-driver Patrick Walsh. Edwards realised a childhood dream in 2018 when he clinched Britain’s premier rallying series in his own backyard on Wales Rally GB. The Llandudno-based driver had a near perfect season as he secured four out of the five wins in his first season with the Cumbrian firm. With a championship signed, sealed and delivered, the target will be well and truly on the Welshman’s back coming into the new season. Now one of the established names in the BRC top flight, Edwards has the gloves on and is ready for all comers. Ever the perfectionist, Matt has vowed to up his game ahead of the Visit Conwy curtain-raiser… a worrying sign for his rivals. With the new season kicking off in just a few weeks, Matt is gearing up for quite possibly his biggest challenge to date – his home rally, and the one he would most dearly love to add to his impressive trophy cabinet.